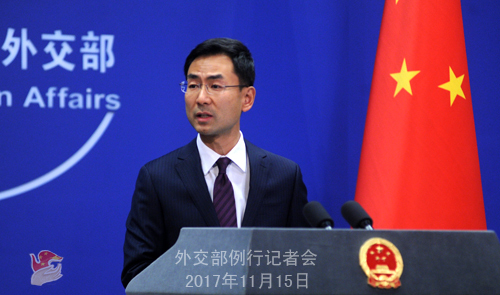 Q: Song Tao, Minister of the International Department of the Central Committee of the Communist Party of China (CPC), will visit the DPRK on November 17 as General Secratery Xi Jinping's special envoy, which would be another headline-grabbing event after US President Trump's visit to China. 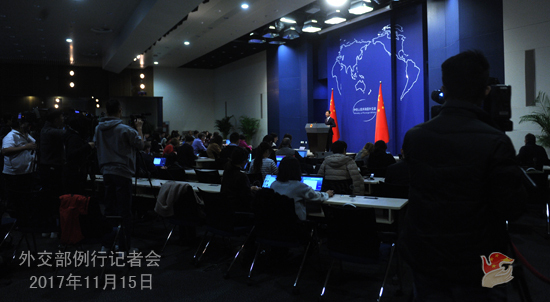 Besides briefing the DPRK side on the outcomes of the 19th CPC Congress, what other topics will be covered? Will the Korean Peninsula nuclear issue be raised? A: You may all have noticed that this morning the International Department of the CPC Central Committee has released the information. 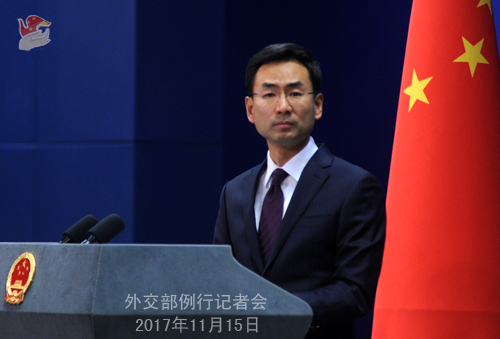 On November 17, Song Tao, Special Envoy of General Secretary of the CPC Central Committee Xi Jinping and Minister of the International Department of the CPC Central Committee will leave for the DPRK to inform the country of the 19th CPC Congress and visit the DPRK. As far as I know, the two sides will also exchange views on the relations between the two parties and the two countries and other issues of mutual concern. Q: Who will Mr. Song Tao meet in the DPRK? Do you have any details on his visit schedule? A: I have no details to share regarding Special Envoy Song Tao's schedule of his DPRK visit. Q: Sources said the former Vice President of Zimbabwe had fled to China. Can you confirm it and comment on the current situation in Zimbabwe? A: As a friendly country to Zimbabwe, we are closely following the situation unfolding in Zimbabwe. Zimbabwe's peace, stability and development serve the fundamental interests of the country itself and other regional countries. It is also the common wish of the international community. We hope that Zimbabwe could properly handle its internal affairs. As for the whereabouts of the former Vice President of Zimbabwe, I can assure you that he is not in China. Q: Is the timing of Special Envoy Song Tao's visit in some way connected with President Trump' visit to China? You mentioned that the two sides will exchange views on issues of mutual concern. Is the Korean Peninsula nuclear issue one of those issues? A: Since you are curious about the timing of the visit, I can tell you that informing each other on Party Congress has been a long-standing tradition between the Communist Party of China and Communist Party of other socialist countries including the Workers' Party of the DPRK. As for what specific issues will be touched upon, I have just said that the main purpose of Song Tao' planned visit is to brief on the 19th Party Congress and exchange views on the relations between the two parties and the two countries and other issues of mutual concern. Q: According to the website of China's Defense Ministry, General Constantine Guveya Chiwenga, commander of the Zimbabwe Defense Forces, was in China last Friday. Did he inform China of his plan on “military take-over”? What is your comment? A: Just like you said, the Defense Ministry already released information on the visit of General Chiwenga, commander of the Zimbabwe Defense Forces. I can only tell you that his visit is a normal military exchange mutually agreed upon by China and Zimbabwe. As for the details of his visit, I have little to share. If you need more information, I would refer you to the Defense Ministry. Q: Will China and Venezuela reach any agreement on Venezuela's debt to China? Second, Venezuela is considering selling a refinery to China. Have you two discussed this? A: As for the selling-of-refinery part of your question, I have no information. What I can tell you is that cooperation in financing and other fields between China and Venezuela is operating as usual. We believe that the Venezuelan government and its people have the capability to properly handle their own affairs, including the debt issue. Q: Do you have any further comment on the quadrilateral meeting between the US, Japan, India and Australia? A: I gave my comment on similar questions two days ago. Again, I can briefly talk about this. Peaceful development and win-win cooperation is the call of the times and the global trend. All countries and regions should heed this call and ride with this trend in the pursuit of development. We welcome any initiative that would be conducive to regional and state-to-state cooperation. And we hope the relevant initiative would accord with the trend of the times and the world, uphold openness and inclusiveness, and contribute to enhancing win-win cooperation among all parties. Q: Considering that China and Japan have made some progress in terms of diplomatic contacts, could we expect more regular meetings between the Chinese and Japanese leaders in the near future? A: As we have said many times, leadership-level interactions are important in guiding the development of bilateral relations. We hope that the Japanese side endeavor to create enabling conditions and environment for high-level exchanges between the two countries. Q: The DPRK has refrained from test-firing ballistic missiles or conducting nuclear tests since September. Do you think that this means the sanction measures taken by the international community and China are working? Is the visit to the DPRK by the Special Envoy of President Xi Jinping linked to this? A: First of all, let me get one thing straight for you. Mr. Song Tao is special envoy of General Secretary Xi Jinping, The primary purpose of his incoming DPRK visit is to inform on the 19th Party Congress. It goes without saying that during the visit, he will exchange views with the DPRK side on the relations between the two parties and the two countries and other issues of mutual concern. 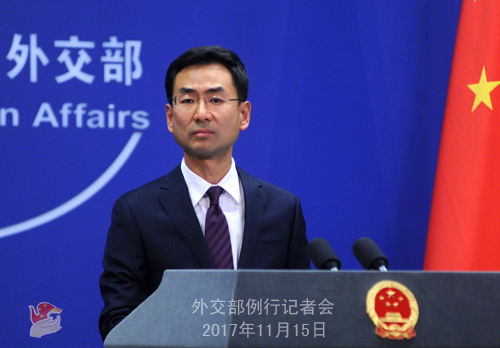 As for your observation on the DPRK, I want to say that it is China's consistent position to achieve the denuclearization of the Korean Peninsula, maintain peace and stability of the Peninsula, and resolve the issue through dialogue and consultation. I believe all sides are very clear with this position. Q: Premier Li Keqiang and Indian Prime Minister Modi had a brief meeting in Manila. The Indian side has released relevant details. What can you give us regarding their meeting? A: So far, I have very little information on what you just said. I believe , it only came naturally that leaders of two countries met and greeted each other on multilateral occasions . Q: President Trump said during his China visit that he hopes China would up its sanctions on the DPRK. Yet so far, the Chinese government has been stressing that it has been comprehensively implementing DPRK-related UN Security Council resolutions, and any new sanction measures must be formulated by the Security Council. Does that mean that China will not sanction the DPRK outside the Security Council framework? A: You are one of the regulars to our press briefing, so you seem to have a pretty good grasp on China's position on the Korean Peninsula nuclear issue. (Journalist laughs) Let's say your understanding is correct. China has been comprehensively, accurately, faithfully, and strictly implementing all DPRK-related resolutions adopted by the Security Council, and fulfilling our due international obligations. At the same time, we oppose unilateral sanctions imposed on the basis of one's domestic laws and outside the Security Council framework. Our position is also quite clear.